Just another example of how pickleball perks interest across the country! If you all remember, we did a story a few months ago about Jay Readinger, who while visiting the community of Highland Lakes in Leesburg, Florida, was introduced to our great game of pickleball. Jay and his wife Mary Lou Gallup relocated to Steamboat Springs, Colorado, and Jay became the USAPA ambassador for that area. Since then he has sparked significant interest and growth in the game. In fact, Florida residents George and Anita Rimler, recently visiting Steamboat Springs found Jay and his group through USAPA's places to play! 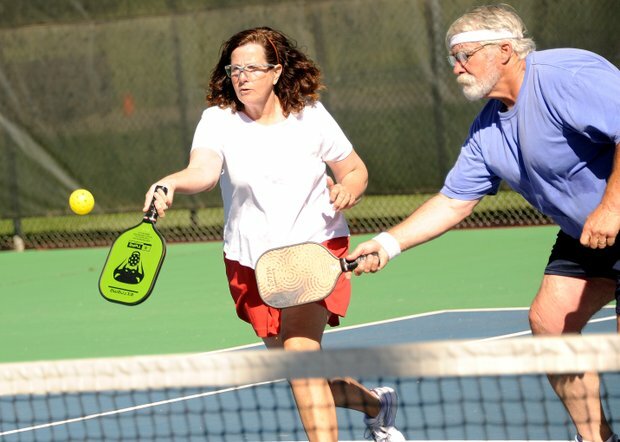 Below is a link to a great article from SteamBoatToday.com that featured Jay's Pickleball group while George and Anita were visiting What's even more exciting is that Anita will be representing Daytona Beach Shores as our new Florida ambassador and she and George will begin to introduce and promote pickleball in their community. Mary Lou Gallup and Jay Readinger rush for a return Friday while playing pickleball on the tennis courts at the base of Howelsen Hill in Steamboat Springs. The pair learned the sport in Florida, where it’s hugely popular in senior citizens communities, and is trying to help it catch on in their new home of Steamboat. 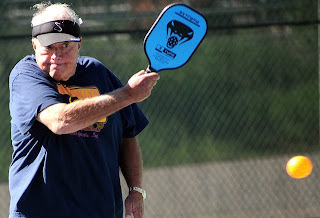 ﻿George Rimler eyes a return Friday while playing pickleball at the Howelsen Hill tennis courts in Steamboat Springs. Rimler and his wife, Anita, are spending a month in Steamboat on vacation.